There are several haunted legends of the Mammoth Cave in Kentucky. Mammoth Cave is actually considered to be a National Park, however, it holds several secrets that locals and travelers have attempted to unveil for quite some time. This popular cave contains several different traveled and uncharted paths and passageways that are full of intrigue and suspense. There are several areas that visitors to the National Park are not allowed access to. Civilization first explored this haunted cave over 12,000 years in the past. 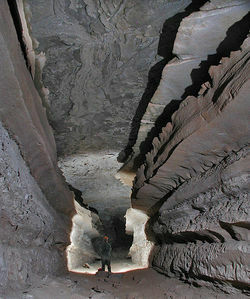 The earliest visitors held the notion that the cave served as a passage from the physical world into the spiritual world. Here, you will learn about the haunted legends that surround the mysterious Mammoth Cave. The original founders of this mysterious cave established that it should be a type of burial ground. These people felt as if they buried the dead in the caves, their spirit could easily transition to the place where they would rest in the afterlife. As the years progressed, it was found that the minerals that lined the cave served as an excellent means of preserving bodies. This was discovered when early explorers to the haunted caves would go deep inside, get lost, and die only to be found much later by others. When discovered, it was found that their bodies would be in decent shape, despite the fact that they may have been dead for quite some time. In the year of 1797, a white man was hunting near the cave and spotted a bear. This man’s name was “Houchins”. The bear ran away from the man, and desperate for his next meal, he followed the animal. It is said that they ran inside of Mammoth Cave. Shortly after this occurred, a man with a vast amount of money decided to purchase the land that contained the cave. Over time, the land that contained this mysterious cave would change hands several times. It was eventually found that at item that was called “saltpeter” was located in the cave. This would result in nearly one hundred slaves being put to work to obtain the substance from the dark passageways in order to make a profit for their owners. tourists would pay a nice price in order to experience the cave firsthand. As more and more tours were given, the tourists and guides alike started to notice strange and unusual events. There was even an area that was called “Haunted Chambers” because of the strange and unusual events that started to occur. It was believed that the spirits that had been laid to rest there never discovered their way to the afterlife, and they were angry with the people touring. They saw these individuals as intruders and wanted them to quit interrupting the rest that they deserved in their spiritual state. There are many spirits that are said to reside in Mammoth Cave. One of the most interesting of these spirits is a lady by the name of “Melissa”. A letter was discovered that indicated that she lived near the cave for quite some time. This occurred in the mid 1800’s. As it is told, Melissa fell in love with a man. He was named “Mr. Beverleigh” and acted as her tutor. Unfortunately, the tutor did not seem to feel the same way that she did, but fell in love with her neighbor and friend. It is believed that she intentionally led this individual on a tour of the cave, and then left him behind. Because he was not familiar with the passageways, he died. Today, many claim that Melissa still visits the cave as a spirit and that the man is still trying to find his way out, despite the fact that both are now deceased. 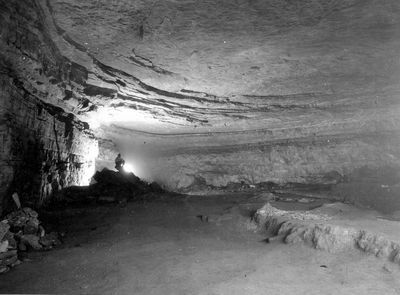 Floyd Collins is another spirit that seems to frequent the caves as a spirit. This man was an avid explorer in life, and it is said that as he ventured into the magnificent cave, rocks fell on him and left him trapped. While he was found by friends, it was difficult for them to conclude a method to remove him from the area. As time progressed, the cave fell a bit more. The new cave in eventually killed Floyd Collins. Today, it is said that his spirit still resides within the passageways of the cave. As you can see, there are many interesting stories when it comes to the haunted legends of Mammoth Cave. If you enjoy hunting for ghosts, you are sure to enjoy a visit to this location. You can call 758-2180, area code 270 to learn how to explore the haunted cave for yourself. If you are in the area of Mammoth Cave, simply look for the National Park signs. Once you find them, follow them to your next haunted place to go tour!